If you should have any questions or concerns, you can contact Coach Tim on his cell. FACILITY: The competition course is a 50 meter 8 lane pool with non-turbulent lane lines with a water depth of 9’ at the start and 4’ at the turn end. The competition course has been certified in accordance with 104.2.2C(4). The copy of such certification is on file with USA Swimming. Daktronics 2000 automatic timing system with touch pads, backup buttons and watches will be used to measure performances. There will be a 25-yard continuous warm-up area with lane ropes. SPECTATORS AND CONCESSIONS: Spectator seating is upstairs in the bleachers. Concessions are available for all sessions. This is a no smoking facility. As guests of the University, we would like to remind all participants and spectators to leave a clean facility at the end of the meet. It is important that all people attending this meet, whether swimmers, coaches, or spectators, treat this facility with the utmost care. Do not go, or let children go, in unauthorized areas. This means any place other than the lobby, seating areas, or spectator’s restrooms. Due to USA Swimming insurance requirements Only swimmers, coaches, officials, and volunteers are allowed on deck. 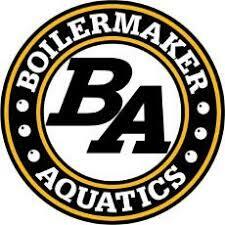 Boilermaker Aquatics will have security persons patrolling the deck and locker room areas. If any swimmer is caught abusing the building or facility, they will immediately be asked to leave the meet and will be barred from further competition. Damages incurred become the responsibility of the swim club of the violator. Friday Afternoon, all visitors should be careful about parking vehicles in restricted areas. After 5:00pm on Friday, most lots will become available and free throughout the remainder of the weekend. All paved and gravel areas are signed/posted for permit parking. Visitors may not park in A, B, or C spaces unless a parking permit has been purchased and displayed. ADMISSION: Spectators of all ages are welcome to attend competition. There is ample seating upstairs for all spectators. All persons 12 years and younger will be admitted for free, and those 13 years and older will be charged $8.00 per day or $20.00 for an all weekend pass.